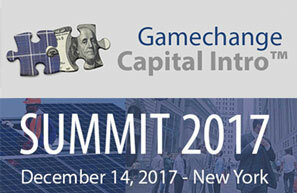 NEW YORK, NEW YORK – December 4, 2017 – GameChange Solar announced today that the company will host the Capital Intro™ Summit in the heart of midtown NYC. The private and complimentary event is by invitation only. The Summit covers several critical topics along with a real-time update and analysis regarding ITC 201 and panel ASP trends. The Summit will then be followed by a Holiday Cocktail Party at an NYC Penthouse on Central Park.